If you have an eligible Samsung mobile device (smartphone or tablet), you may qualify for a free monthly e-book from the Amazon Kindle store. As with many things Samsung, there is an ecosystem twist to it. You have to download the Amazon Kindle app from Samsung’s own app store. This is a plus if you have an S-Pen device, because Amazon made this particular version work with the S-Pen (eg highlight text or blazing fast page turns). Anyway, if eligible, they have four more ebooks to pick from during December 2015. As usual, you get one of those four for free. If you want more than one, you have to pay for the second and later. You have until December 31 (2015) to make a choice, but don’t wait until the last minute! All you have to do is locate the email with the promotion, and click that red button to add the promotion to your Lucky’s rewards account. Then buy it in-store before the deadline, and their cash register will automatically deduct it. If you are using self-checkout, it may need an override from an employee. 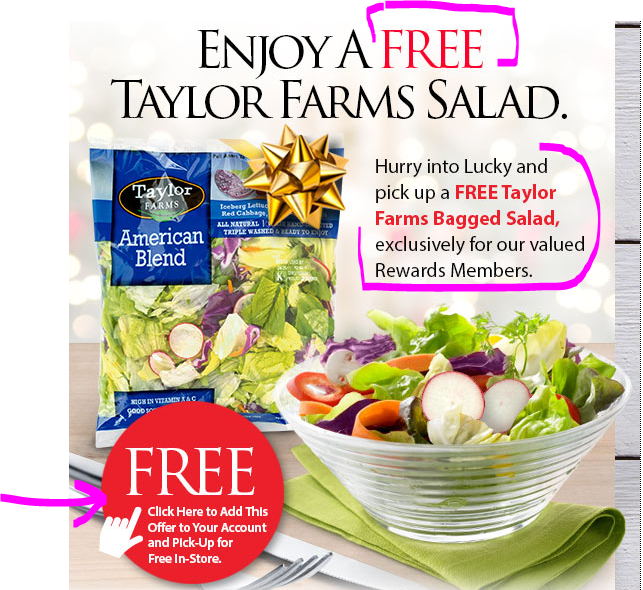 Which brings us to now, good until they close on Tuesday 12/8/15, you get a free bag of Taylor Farms Bagged Salad. Options includes different varieties ranging from 5 to 12 ounces in weight. The email does not specify all the eligible options, so you have to go in-store to spot those. I haven’t picked mine up yet (I will post an update once I go there and see what options are available).